Glasgow Hawks avenged their Cup Final defeat of last April with an opening day success in the BT Premiership at Goldenacre today. More enterprising and purposeful from the outset, Hawks had looked in command with a 17-5 half-time lead and Heriot’s briefly down to 13 men around the hour mark. But just like their hosts, as the clock ticked into stoppage time and the roles were reversed with Hawks now with two men on the naughty step, neither side were able to play with sufficient composure and savvy when they enjoyed a numerical advantage. His praise, too, for the “excellence” of the Hawks scrum, particularly in the first-half, was justified. Heriot’s coaches, Phil Smith and Steve Lawrie, were left to bemoan a performance riddled with errors and though they may have escaped with a draw had white line fever not afflicted their pack in the finale, which should take nothing away from Hawks’ defence. The last time George Horne, younger brother of Glasgow Warriors and Scotland back, Peter, had appeared at Goldenacre, he was in the colours of Currie and, from memory, lining up at full-back. He was instrumental in his team gaining a draw that day. Today, Horne, in what I’d guess would be his preferred berth, was sparky and animated. Together with defence and some intelligent touches from the likes of Haddon McPherson – how great to see the diminutive winger know his laws and counter-ruck with venom – Hawks were worthy winners. Hawks’ first-half tries came from scrum-half, Paddy Boyer, sailing through a gap in Heriot’s close-quarter defence off the back of an advancing Hawks’ scrum, and full-back Robbie Houliston, rounding off a really sweet inter-change between Horne and the ever-lively Fin Gillies. Horne converted both tries. 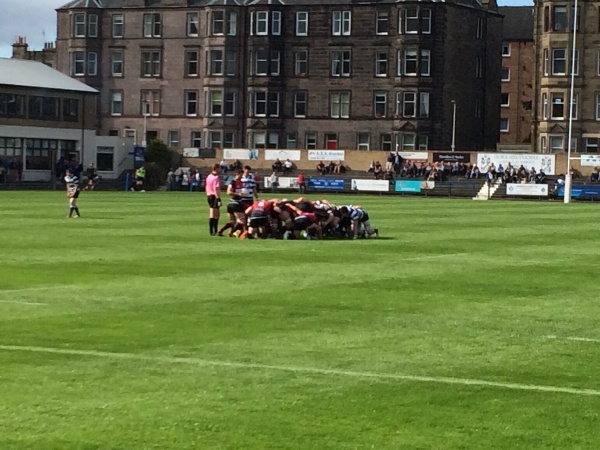 Jason Hill, surging from a Heriot’s lineout success against the throw, created the position for the hosts’ first try. Murray Douglas took contact when a pass might have been the easier option but, no matter, as Heriot’s recycled for Max Learmonth to go over. Graham Wilson missed the conversion, whereas Horne added a penalty right on half-time for that 17-5 lead. The second-half didn’t really appear to be going anywhere fast. Learmonth and Hill were sin-binned for Heriot’s but Hawks could not punish their indiscretions and after they were restored to 14 men, they worked ball right for Cameron Ferguson to cross for their second try. Wilson again missed the conversion. Into the closing stages and Hawks had Davie Milne and Sam Thomson yellow-carded by referee Andrew McMenemy and although Heriot’s pressed, Hawks defence stood firm, bundling replacement winger Charlie Simpson into touch when Heriot’s opted for width late on.